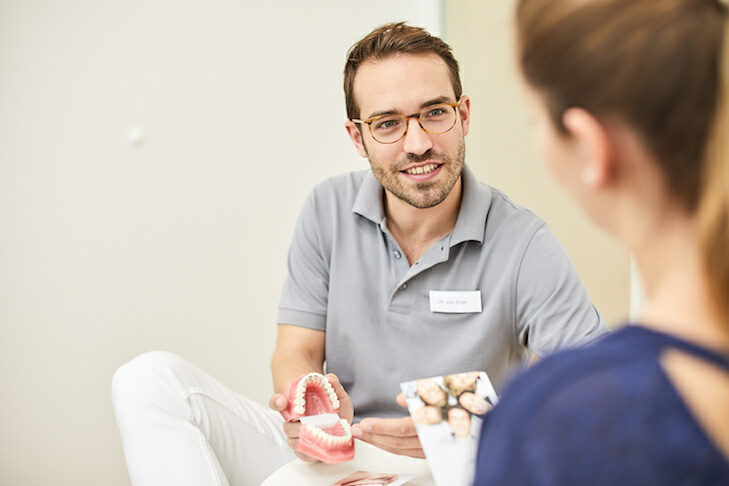 Being an orthodontic practice in Munich-Unterföhring that specialises in invisible orthodontic treatments, we are more than happy to inform you about the fixed brace on the inner surface of the teeth. Whether you are an adolescent or adult – the invisible lingual brace comes highly recommended from a medical and aesthetic standpoint. An orthodontist who is experienced in the field of lingual orthodontics can fix most dental misalignments without any compromise. The brace on the lingual side is exclusively customised to your dental fingerprints. This guarantees a perfect fit when the orthodontist affixes the braces. By nature of the flat design, the acclimatisation period for tongue is minimal. Compared to the standard fixed braces, the lingual brace is particularly protective against cavities and decalcification of the teeth. There are several reasons to explain this phenomenon. Fist of all brackets on the inside cover a bigger part of the tooth surface than outside ones. And as they are custom made they do this more accurate than conventional brackets. The by the lingual bracket covered surface of the teeth is inaccessible for caries in the first place. Moreover, the saliva flow is more concentrated on the inside than on the outside. The positioning of the tongue also introduces a particular cleansing functions on the brackets. Scientific studies have also concluded that tooth decay occurs far less frequent lingual orthodontics in contrast to the standard fixed braces. Treatment and application of invisible braces on the inside of the teeth requires expert knowledge. 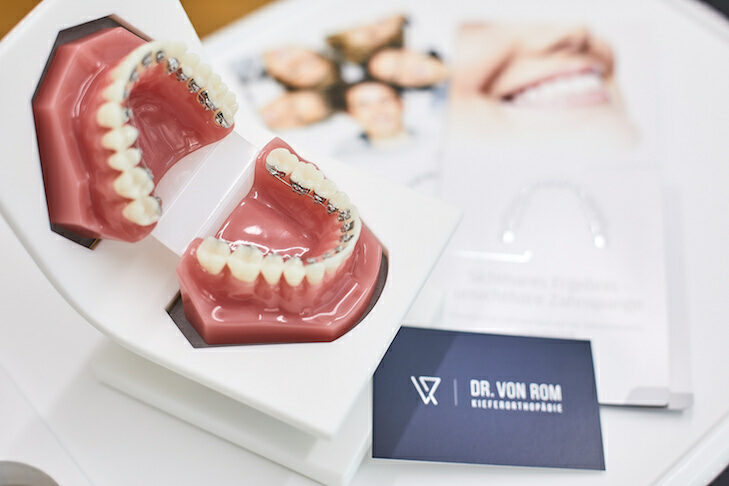 Dr. von Rom based in Munich-Unterföhring has the certification for both of the industry leading lingual brace systems, WIN Lingual Systems and Incognito. His advanced training to become a specialist orthodontist was successfully obtained at the Medical College Hannover (Prof. Dr. Schwestka-Polly, Prof. Dr. Wiechmann), a leading institution in the field of lingual orthodontics. The invisible lingual brace allows you to go through your day unencumbered and without the usual aesthetic constraints otherwise associated with braces. Please contact us to arrange an appointment for a personal consultation at our orthodontic practice in Unterföhring in the north east of München. The lingually placed braces are completely invisible. Through the custom fitted manufacture of the braces, the results are extremely precise and predictable.. Treatment bears a 10 times lower risk of tooth decay or decalcification compared to conventional braces. The lingual brace has earned its reputation as being very gentle and protective on the teeth. The following videos effectively demonstrate the possibilities the lingual brace provides.